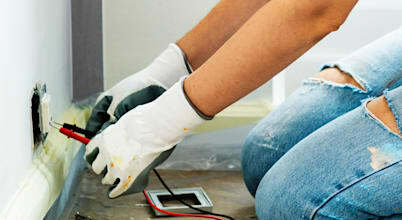 Electricians are one of the most vital services you need to work on your house. The house wouldn't function properly without their work, especially when it comes to lighting. They are also useful in detecting and rectifying faults in your property, for example, faulty wiring or leakage may cause problems with the voltage and power. It is their job to make sure there is proper wiring and a sturdy MCB to ensure your home has safe electricity. In addition, electric heaters that have malfunctioned can be repaired by an electrician or can even be replaced with new heaters and installed quickly and efficiently. An electrician can also help in descaling salts that may have set on the walls of the geyser. In terms of lighting, they can help you repair or replace where needed. You can also leave external lighting up to them to install in your garden or for festivals, weddings and other events. When it comes to security systems, if you are needing extra security, an electrician can connect the alarm to the doors. This will cause an alarm to go off whenever anyone tries to break into your property – which can be extremely useful if you are worried about a break in and a very helpful way to feel more protected in a big city like Bristol. Electricians can also install proper inverters and other related devices to help you deal with power cuts, as well as heating controls and sensors. If you are building a new home, electrical wiring is one of the most vital features even before finishing construction. To get the best electric supply throughout the whole house, you will need an electrician to work with the proposed layout. You may also want to hire an electrician in order to sort out any of your exterior lighting needs as they will be able to help to decorate your garden for a special occasion or even just for yourself in the summer. When it comes to your bathroom, your electrician will need to work closely with your plumber. They will also be able to work on different aesthetic aspects of your home from the lighting, spotlights for mirrors and where you want electric connections for hair dryers or other home appliances go! How do I find high quality electricians in Bristol? There are many electricians in Bristol so finding one won't be a problem. The best way to search is online as there will be reviews and feedback from previous clients so you can weed out the low quality electricians. Also, more information on the person may be available, including experience and qualifications. In addition, you can also view their type of work and particularly if you have special equipment, whether they have the skill to use it. Word of mouth is also useful from neighbours and friends or if you have just moved, building maintenance suggestions may help. All this research will assure you that you have an electrician you can trust and who is properly skilled to make sure your house is finished properly. Another great option is right here—homify also works as a trustworthy medium to finding great services, for example, electricians, plumbers, floor fitters, etc. 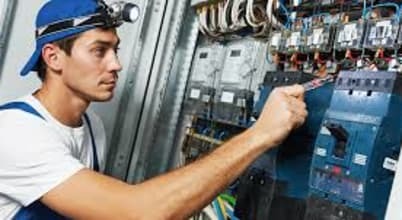 What do I need to look out for when hiring an electrician? When looking for an electrician, make sure you find someone loyal, professional and reliable. Online agencies can be useful, but not all are trustworthy. You should carry out research about the agencies, websites and payment options before booking a service. Word of mouth can be one of the most reliable ways to find an electrician as you then have assurance of their reliability based on their previous work. Advertisements and newspapers may contain discounts and deals on electricians. You need to ensure you avoid being cheated by low class service or rates. You should also make sure to speak to your electrician before you hire them – make sure that they have been highly trained, have a lot of experience and are capable of undertaking the work you need! You need to make sure that your electrician is also a reliable and efficient! You should use reviews online, check out Facebook pages and make sure to speak to any previous clients, if possible! How much will an electrician cost in Bristol? To find out the cost and prices of an electrician, the internet is the best medium to choose! Google is invaluable for finding different electricians rates quickly. Another way is to ask your friends, neighbours, colleagues or building management as they will be able to guide you if they have recently used an electrician. This is a great way to find out the local rates, and this way you can ensure that you are less likely to be ripped off. When using freelance electricians ask the rate before confirming you need them for your service. It may cause problems down the line when you call off the service after hiring them! In order to get a good rate from an electrician, it is worth choosing someone who you think is reliable and sticking with them so that they know you are a valued customer! How can I keep the costs down when hiring an electrician in Bristol? Unfortunately, the assurance of getting an electrician at the right price isn't given, especially in big cities. Therefore, you need to take extra care when making a choice of which electrician to go with. Research is a must before directly contacting the service as it can save you from being ripped off. Someone who has been suggested by friends or your other contacts will be the most effective way as then you are fully aware what service they provide and their general charge. In addition, referrals may help lower the cost as well. Freelance electricians can save you some pennies too as with big agencies, more people are involved and which usually means an extra expense. One way which is especially effective for keeping costs down is to make sure you never call an electrician during the night or on holidays as they are more likely to charge you a lot more! Unless you have an emergency, it is definitely worth avoiding these times! You will find that when it comes to building your own home from scratch, there are hundreds of different people who are able to help you out. This may seem daunting, but once you know where to look, you can easily find the right people for the job. Checking their reviews, references, experience and Facebooks can certainly help you out. Check out the many different professionals that you can find on homify if you are unsure of where to begin! Below are some of the people who you should definitely consider too! You will find that painters in Bristol aren't hard to come by. There are a lot of daily wagers and contractual painters working in Bristol and surrounding areas that can help you with long-term or short-term projects. From painting your whole house to simply one room, painters will be available for whatever you need. Many people believe that they are able to do the work of a painter themselves, however, it is more likely that you will not be satisfied by the finished work as a painter is able to get a much more flawless finish than an amateur! Your research for a plumber should follow the same advice as your research for an electrician. This ensures you are getting efficient work for your money. They provide a range of facilities, including pipe repairs to bathroom installation and even kitchen installations. Plumberscan work closely with electricians to give you highly functional rooms. Asking your plumber for a trustworthy electrician may be a good idea or vice versa. Joiners are also easily available and hard working as long as you do your research. Their responsibilities include attaching wooden accents in your property. Joiners can offer you a variety of products based on your taste and design. They are yet another vital element in creating your fully functioning house. Whether you need something to hide the pipes in your home or the electrics – a joiner will definitely be able to help you here! You can find someone perfect for you right here on homify!